September is always a time of flux for grad students. It doesn’t matter how many years you’ve been in the program – there’s always some stressor that crops up in tandem with the start of a new school year. You could be TAing a new class, taking a seminar with a faculty member known for their withering remarks, meeting an entirely new cohort, learning your way around a new town, or preparing a proposal for your committee to lovingly and tenderly eviscerate. Additionally, there’s the common panic of realizing that you did not get nearly as much accomplished over the summer as you thought you would. Unfortunately, these are not problems I can help you with. What I CAN do, however, is teach you how to ID fragments of a femoral shaft relative to other long-bones. As I’ve mentioned before, fragments of long bone shafts can be particularly difficult to identify with confidence, because so much is contingent on an awareness of the shape of the shaft in cross-section. When I’m working with fragmentary and commingled long bones, I begin by sorting the fragments by size – if you have circular shaft frags, you can use their diameter to quickly separate out large long bone fragments (femur, tibia, humerus) from small long bone fragments (fibula, radius, ulna). 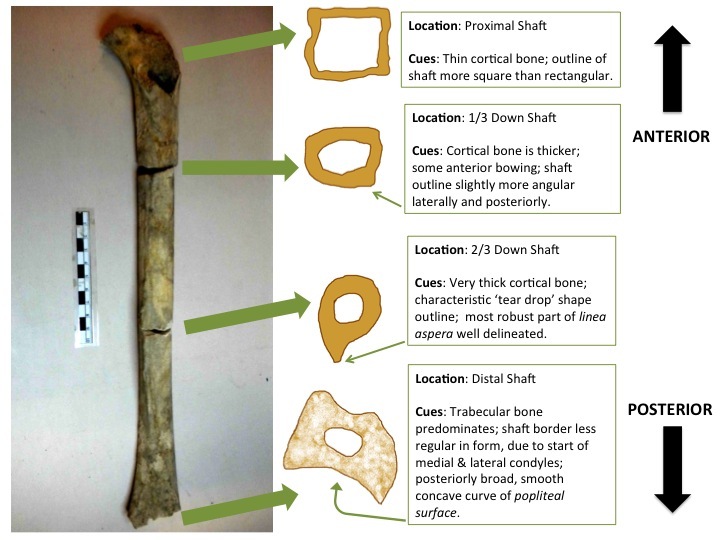 Similarly, thickness of the cortical bone and an estimation of diameter based on preserved shaft curvature (e.g. deciding how big the diameter of the bone is likely to be based on the portion you have) can be useful strategies. Finally, the most telling feature of the femur is the linea aspera, a muscle attachment site that runs down the posterior surface of the shaft (see the Gray’s figure, above). It differs from the most rugose muscle attachment sites of the humeral and tibial shafts because follows a very straight trajectory down the posterior portion of the mid-femoral shaft. In contrast, both the soleal line (tibia) and deltoid tuberosity (humerus) have their own distinct curvatures, so they can be easily distinguished from the femur. However, if you’re dealing with smaller fragments of shaft, I made another “kindergarten fridge project” map of cross sections of the femoral shaft. That Ian Malcolm. What a cad. Image Credits: Figure of femur with muscle attachments found here. Photo of the femur taken at the Museo de Jaén, Summer 2013. This entry was posted in Fragmentary Remains, Long Bones, Osteology and tagged Femur, Identifying the femur, Shaft Fragments. Bookmark the permalink. Everything from the title to the video clip makes me happy.